Thanksgiving is less than two weeks away and the grocery list is already posted on the refrigerator door. Packages of Christmas candy are on their way to Iraq and more sit waiting to be packaged. I think I have realized that is is important -- for all of us -- that Christmas be as "Christmasy" as possible. I can't replace Noah for the rest of my family. Who could possibly replace Noah's wit and humor or the sly smile with a twinkle in the eye? But I can make sure that the things within my control are as "normal" as possible. The tree will still go up, with more yellow ribbons than ever before. The nutcrackers, of course, will grace the mantle with the Marine nutcracker leading the parade. For Emmie, the lights will go up outside this year. The presents for Noah will wait and when he comes home he can open them all and eat turkey to his heart's content. I think I have realized that the holidays aren't merely a celebration . If that were so then Noah's being so far away could easily ruin them. No, the holidays are a declaration. A declaration that what the Lord as done in and through and to and for us is so great that it is worthy of the commemoration regardless of the circumstances. God has proven Himself so very faithful even in this and we will seek this time of the year as a time to declare and affirm the Kingship of the babe in the manger, the faithfulness of the God of our forefathers and the blessings of the Lord who allows us to turn one more day of the calendar. We will praise Him because He alone is worthy. When I was young, my Daddy's brother made cast nets to sell. I loved to look at them. I loved the tied knots and the shiny string from which they were made. I always wanted to play with one, but for my Uncle Fred, cast nets were not meant to be the play things of little girls. Later as a teenager, I had the opportunity to watch my Daddy throw a cast net. I watched as, standing in the small boat, he flung the net far from himself -- a holey parachute of net and knots crashing into the water of the bay. How he did this without falling out of the boat amazed me. The main point of a cast net, however, is not primarily the casting. It is the pulling it back in again. When you pull the net back in, hopefully it is full of sea creatures waiting to be transformed into a delectable dinner. The Apostle Peter, who through the inspiration of the Holy Spirit, penned "Casting all your cares. . ." was a fisherman. Clearly his intent was that we fling our cares to our Saviour much as Peter himself had flung a net to the sea hundreds of times. But Peter surely knew, too, in writing this that the casting is necessary in order that we might pull to the boat the catch in the nets. When we "cast our cares" upon He who has been referred to as the "Shoreless Ocean", we should have the full assurance that the nets will not come back empty. Our nets will be "exceeding abundantly" full "above all that we ask or think according to the power that worketh in us." Perhaps our nets will be full of peace, abundant with comfort or joy. Perhaps we will see a specific answer to prayer regarding the very care we cast upon Him. One thing is certain, when we cast our cares upon Him, our nets never return empty, for He careth for us. Thirty-three years ago his hand reached across the table and took mine and my heart fell into his. We began a long and beautiful dance that has had many varied, surprising and unfettered steps. Our hearts have grown together so closely that any attempt to separate them would cause both parties to, as Charlotte Bronte's Mr Rochester describes, "bleed inwardly". We are totally different and totally alike. We are like a hand and glove and yet like a knife and it's sharpening steel. We make each other better, give each other purpose, add strength and balance to the other's talents. We temper and smooth the other's weaknesses. What a blessing from the Lord to have been united with someone who so perfectly completes and compliments who and what I am. What a joy that after thirty-three years I can say he is even more my best friend today than he has ever been. The very beginning of the Christmas season is in the air. Decorations line the shelves of the stores, supplies for holiday baking have appeared at the grocery store and Emmie is deciding what to give everyone. Usually this brightens my mood and lifts my spirits. . .but not this year. I haven't actually dreaded a holiday season since Momma died, but that is exactly how I feel this year. Well, not exactly. The year Momma died, I knew she was in an infinitely more wonderful place and wouldn't have brought her back for even a second. My thoughts, too, were centered around my children and how I could possibly fill the void that the passing of Grandma Dot had left. This year I feel sad because Noah won't be with us for the holidays, but it is so much more than that -- it is because Noah won't be with us for the holidays, and that is something very different. He is not in an infinitely more wonderful place and I would bring him back at the drop of a hat if I could. No, he is in an infinitely worse place and somewhat like that Christmas in 1997, I am unable to fill the void, unable to make it better. So when my mind rushes ahead to contemplate the holiday celebrations, I know that part of my heart is on the other side of the world. As that mythical green creature tries to remind us each year: "It came without ribbons! It came without tags! It came without packages, boxes or bags!" His realization in the snow is something we know in our heart all year through: "Maybe Christmas, doesn't come from a store. Maybe Christmas. . perhaps. . . means a little bit more!" May this Christmas for Noah -- so unlike any other he has ever known -- draw him so close to the King in the manger -- may the Star of Bethlehem so light his heart -- that he will proclaim this to be his most wonderful, merriest Christmas ever. And may he have. . .
. . .a "merry little Christmas now." At work each day I print out an updated copy of the next few days scheduled cases. Each type of case is highlighted in a different color highlighter so we can tell at a glance what type of patients will be arriving that day. I looked everywhere for the markers. I looked in my work bag. I looked in every desk drawer. I looked to see if we had other markers, but didn't find anything that worked as well as the ones I had before. All the time, the markers were tucked away in the pocket of the jacket I was wearing, just waiting for me to pull them out and use them. 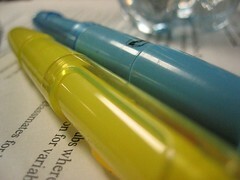 The markers were there, in my pocket, already provided for my use, but I did not believe they were there. I didn't reach into my pocket to remove them, I didn't even look in there to see if they were there. I didn't avail myself of the provision that was already made for me in my moment of need. How many more times in my life has that happened and didn't know it? How many times has the Lord been the great supply of my life and I never even "looked in my pocket" to see what was there. I just kept looking at the need and never turned my eyes toward the supply. The Lord has promised to supply all our needs by Christ Jesus. We must train our eyes to not be focused on the need, but He who is and always be our supply in all things. . .
What a wonderful way to hear the news of Noah's promotion, flowers on my birthday! I hadn't expected to hear from him at all but when Glen brought the flowers - with a teddy bear wearing a birthday cake as a hat -- I knew they must have been from someone who knew me well. As I read the card, my first reaction was to cry. My son on the other side of the world, fighting a war, remembered my birthday! Then I actually read the signature, Corporal Noah Davis. It was like a present on top of a present! Then to talk to him later in the day was best of all. Each time he calls it is like a confirmation that the Lord is keeping him safe. And it is a miracle of modern technology that we could talk at all. It is strange but I am less tempted to fear now than I was before. When Noah said that the enemy was firing mortar rounds at their base all the time, I was strangely comforted, because he also said the mortars were not hitting them. While Noah may attribute that to poor marksmanship, I attribute that to the mountains full of "chariots of fire" -- those angels encamped around that base protecting the 7th platoon. It reminds me of the verse, "A thousand shall fall at thy side, and ten thousand at thy right hand; but it shall not come nigh thee. " That is my prayer for Noah: "it shall not come nigh thee." There are some new things that I just love. I love a new purse. I love taking my things out of the old one and deciding how they will fit in the new one. I love the feel of a new purse and getting used to how it feels on my shoulder. I love a new calendar, it is the promise of all the days ahead and all the potential of all those days. I love a new Bible. Years ago when I was given a new study Bible, someone told me it was important to take the time to turn every page. This was so that you wouldn't accidentally tear a page if they stuck together. I believe I have done that with every Bible I have been given since then. A new Bible is like holding the most precious of gifts and realizing you hold in your hand more potential for growth and truth than you could ever know in a thousand lifetimes. I love a new pen. I just love pens, but especially a new pen. Writing with it, learning the little secrets every pen has --if I hold it this way it scratches some on the paper, if I hold it that way, it tends to skip. I love a new journal. I love journals and have several of them that I use for different topics. I love to wait until I know exactly what I will use that journal for. I like wondering what will happen to them long after I am gone, if anyone will ever read them or if they will just end up in the trash, or in a box stored away in someone's attic. As much as I love new things, I love old things too. I love having something that I know has been much handled and loved. I love looking at an old book knowing that hand after hand has turned the same pages I am turning and reading the same words that I am reading. I love my old Christmas ornaments. 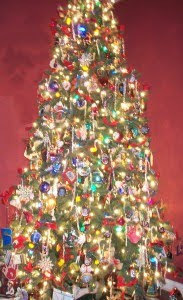 I have some ornaments on our tree that I put on my trees as a young girl. 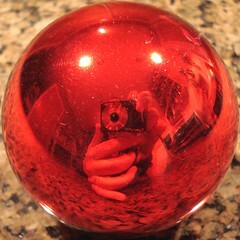 I love to think about how many times I might have looked at my own reflection in those shiny balls. This marriage of old and new, it is a beautiful theme, respecting what has come before, but appreciating the new as well. So with that frame of mind, I look toward a new year. A potential of promise and hope, a year of expectancy. I expect to see the Lord work mightily in my life, in the lives of my family members, in my country, in all those things that burden, concern or frequent my heart. I will look at the little blocks on the calender with two words in the back of my mind, "Expect God". I guess I have to face the truth. . .the boats are in storage for a while. The air and water temperature are both 32 degrees. It will be awhile before the water is warm enough for either of us to brave sitting in it. Now it will just be watching the temperature to see it come up gradually. I know we will be out by April because I have read that the wild irises bloom in Conway creek in April and produce a gorgeous display of bright pink blossoms. So, I'll keep my eye on the water temp and we'll be back when the water is a little warmer! Years ago when Noah first went into the Marine Corps I was given great advice, "If he is deployed, don't listen to the news." These were truly words of wisdom spoken from a woman who had "been there". The other day I was on the treadmill at the gym, surrounded by a bank of televisions, one which was on a news channel. I couldn't hear the narration and I wasn't really reading the closed captions, but the visions and images of desert cammie-clad soldiers walking along sandy streets made me think of my Marine and my eyes welled up with tears. For a few minutes it was a struggle to maintain control, but even though my emotions were in turmoil, my faith was sure. My son's safety is of the Lord and the Lord will work all these things for Noah's good, because, as for the Lord, His way is perfect.